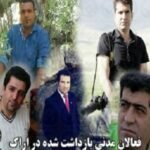 Human Rights Activist News Agency (HRANA) – On the morning of October 28, 2018, attorney and human rights activist Mohammad Najafi and civil activist Abbas Safari were arrested and transferred to Arak Prison to serve their sentences the same evening. Both men were previously detained along with nine others for participating in the January protests in Shazand County. Judge Mohammad Reza Abdollahi of Arak Criminal Court No. 2, Branch 102 sentenced both Najafi and Safari to three years in prison and 74 lashings for “publishing lies with intent to disrupt the public mind” and “disturbing the public peace.” The sentences were upheld in branch one of Markazi province Appeals Court. Najafi got wind of his new “publishing lies” accusation via a writ he received October 13th from branch 1 of Shazand Investigation and Prosecutions office, where he was interrogated and ultimately charged for it. Both Najafi and Safari have additional charges pending investigation in the Revolutionary Court of Arak. Najafi was previously detained for inquiring into the death of civilian Vahid Heydari, who died in Police Detention Center No. 12 amid the January protests. Najafi challenged Iranian judicial authorities who had claimed Heydari was a drug dealer that committed suicide while in custody. Najafi’s interviews with Heydari’s loved ones suggest that Heydari was a street peddler with no criminal record, whose autopsy report showed none of the typical markers of suicide, but did indicate head injuries consistent with blunt-force trauma. Tehran MP Mahmoud Sadeghi accused security authorities of fabricating the grounds for Najafi’s case, arguing that Najafi had simply proven that Heydari was not a drug dealer. Safari, age 41, married, unemployed, is a resident of Shazand County who until his arrest on Sunday had been free on bail. Arak and Shazand are located in Markazi Province, south of Tehran. 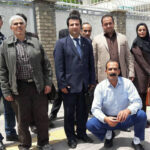 Human Rights Activist News Agency (HRANA) – On Wednesday, October 3rd, Branch One of Markazi Province Appeals Court convened to review the sentences of 11 defendants charged in relation to the nationwide protests that broke out in January of 2018. Among the accused is attorney and human rights activist Mohammad Najafi, who stated that “economic problems” compelled him and his co-defendants to join the ranks of the January protestors. Najafi’s co-defendants are Ali Bagheri, Abbas Safari, Behzad Ali Bakhshi, Mohammad Yaghoubi, Yousef Shirilard, Neda Yousefi, Davoud Rahimi, Massoud Ajlou, Mohammad Torabi, and Kian Sadeghi. Discovery into these protestors’ case file began March 13, 2018 in Branch One of Arak Investigation Court, by which point all 11 had already been interrogated by the Intelligence Office. Ten of the eleven were present during discovery, where an investigator deliberated on charges from disrupting the peace to gathering and conspiring. Though all of the accused were detained amid the protest site in Shazand city where all of them are residents, authorities inexplicably forwarded their case to the judicial office of Arak. All denied the charges brought against them. Investigation court settled on a charge of “disrupting public peace through participating in an illegal gathering,” which according to HRANA reports incurred them one year of imprisonment and 74 lashings each, per the ruling of Judge Mohammad Reza Abdollahi in Arak Criminal Court No. 2, Branch 102. Najafi was previously detained for inquiring into the death of civilian Vahid Heydari, who passed away while in custody of Arak authorities amid the January protests in Police Detention Center No. 12. While Iranian judicial authorities had claimed Heydari was a drug dealer who committed suicide during his detainment, Najafi’s field research, including interviews with Heydari’s family and friends, concluded that Heydari was a peddler with no criminal record; what’s more, his autopsy revealed no physical marks suspect for suicide. Buried under security supervision, Heydari had head injuries consistent with blunt-force trauma. The court tried Najafi for his inquiries on June 9, 2018, in Arak Criminal Court No. 2, Branch 102. His hearing had previously been delayed due to the absence of the judge. Ministry of the Interior Abdolreza Rahmani Fazli previously stated that public demonstrations “turned violent” in 40 of the 100 cities where the January protests broke out. HRANA News Agency – Since the beginning of public protests in January, a number of civil activists from Shazand and Astaneh, including Kian Sadeghi, Behzad Alibekhashi, Mohammad Najafi, Ali Bagheri and Abbas Safari, have been arrested by security forces. 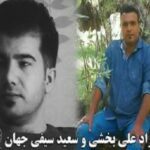 The arrests took place in a special way after they took part in the disclosure of how one of the protesters of the recent events, Vahid Heidari, died in the Arak Basij detention center. So far, two of these detainees have been released on a bail, and the rest of them have been transferred to Arak Prison by completing the interrogation process. HRANA News Agency – Behzad Ali Bakhshi, a civil activist who had been arrested in connection with the protests in the Central Province in January, was released on the bail of 3.5 billion IRR from Central Prison of Arak on February 27. Saeed Seifi Jahan, one of the detainees on February 1 was also released from Evin Prison on the bail on February 26.